Amilla Fushi's relaxed and unstuffy approach to glamour has ensured its place as a favourite among elite travellers visiting the Maldives. 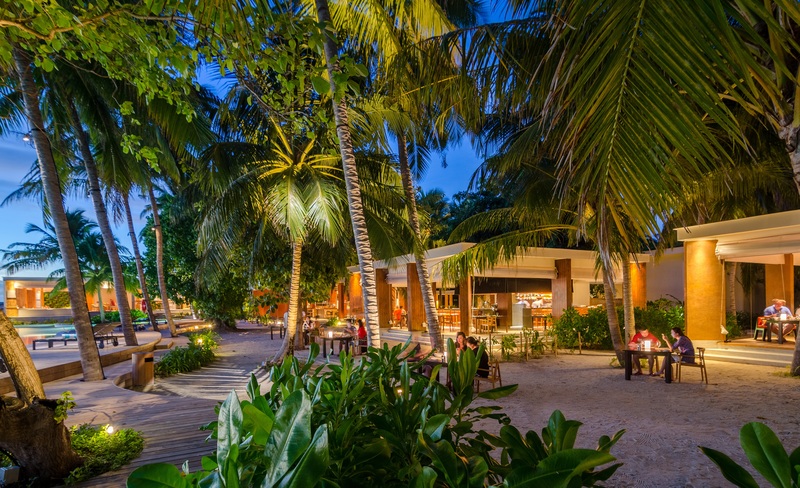 Nowhere is its barefoot luxury approach more evident than in its chilled-out foodie hub Baazaar, which gives guests the opportunity to indulge in diverse culinary offerings from around the world whilst relaxing around one of the biggest swimming pools in the Maldives. As part of Amilla Fushi’s always exciting and ever-evolving food and beverage offerings, a visiting chef’s programme has been created that introduces internationally renowned culinary talents as well as world famous brands to enhance guests’ island experience. In the coming 12 months, Barolo Grill at Baazaar will showcase a select series of pop-ups by culinary greats, kicking off on 1 – 10 May 2017 with the first of four stages this year by the team from Gordon Ramsay’s celebrated London restaurant, Bread Street Kitchen. A further three Bread Street Kitchen pop-ups are scheduled for 16 – 27 October, 19 December 2017 to 10 January 2018 (Festive Season) and 23 March to 7 April 2018 (Easter). Reflecting a similarly relaxed approach, London’s Bread Street Kitchen is a lively hangout that uses fresh, seasonal ingredients and delivers globally inspired menus to the high standards expected from a Gordon Ramsay Restaurant. The pop up’s menu at Amilla Fushi will feature signature dishes from Bread Street Kitchen London, many of which have been given unique Maldivian twists. Grass-fed meats cooked on an open flame grill, will sit alongside classics recreated using local ingredients, such as Red Snapper carpaccio, ginger dressing, horseradish, avocado and wakame; spicy tuna tartare with chilli garlic, sesame oil, spring onions and wonton crisps; Chermoula spiced prawns with pickled veg, shallots, celery and chilli dressing, and a compressed Bombay Gin watermelon salad. The Bread Street Kitchen Amilla Fushi will also offer a daily fish special. Gordon Ramsay chefs will choose a fish that has come in on the boats and create a bespoke fish dish each day. The Bread Street Kitchen London cocktail list has also been given a Maldivian makeover, bringing tropical flavours into classic cocktails. Mouthwatering cocktails created especially for the event include It’s About Thyme, a refreshing vodka-based cocktail with Limoncello, thyme syrup, Champagne and lemon foam, the fruity Grey Goose Royal, with Grey Goose vodka, Aperol, lime, passion fruit and Testulat Brut cart d’Or and many more. The upcoming calendar of pop up events further underlines Amilla’s deserved reputation for culinary excellence and creativity, complementing the sophisticated, gourmet Emperor General Store café-deli, the carefully curated fine wines and artisanal cheeses at the island’s The Wine Shop & Cellar Door. Amilla’s fabulous 60-cover, signature over-water restaurant Feeling Koi - brainchild of the resort’s curator and CEO of the Small Maldives Island Co., Mark Hehir - showcases a selection of artfully crafted sushi, nigiri and sashimi in Japanese-inspired minimalist surroundings, with a private open-air dining room and open deck seating by the water’s edge and an open kitchen. Located just 30 minutes by seaplane from Malé International (Velana International Airport), Amilla Fushi offers a choice of 59 Houses that sit gracefully over crystal clear waters, nestle among lush tree tops or hug the shores of pristine white sand; plus eight spectacular four- to eight-bedroom Beach Residences ideally suited to large families, groups of friends and VVIPs seeking the ultimate in space and privacy. Amilla’s innovative restaurants range from the diverse, informal foodie hub Baazaar to the relaxed yet sophisticated overwater dining at the signature Feeling Koi. Guests can even drop in to gourmet café and deli The Emperor General Store or The Wine Shop & Cellar Door to treat themselves to lighter snacks, a favourite bottle or a gourmet selection of artisanal cheeses. With an unrivalled range of purpose-designed multi-bedroom accommodation options, and an exciting, inspiring and active Kids’ Club The Sultan’s Village, Amilla Fushi is putting the Maldives on the map as a destination not just for couples, but for families and friends. About The Small Maldives Island Co. The Small Maldives Island Co.’s main focus is on Resort Management in the Maldives for Coastline Hotels and Resorts. Amilla Fushi and sister resort Finolhu are owned by Coastline Hotels and Resorts – part of the Coastline Group of companies, one of the Maldives’ largest private companies, established in 1994. The Coastline Group is engaged in logistics; oil importing, storage and distribution; pilling and construction; building material supplies; hotel resort development; condominium development; airport ownership, development and operation; and luxury yacht and boat manufacturing. It is the largest importer and distributor of Fuel Related Products such as Marine Gasoil and Mo Gas to resorts in the Maldives, servicing 65 per cent of the country’s resorts through its company Asian Gasoil. In addition to building both W Maldives and Huvafen Fushi, Coastline’s recent developments within the tourism sector include Mudhdhoo island, subsequently acquired by Dusit Thani Hotels; Baa Atoll’s Dharavandhoo Airport; and the newly opened Raa Ifhuru Airport. Bread Street Kitchen is an all-day restaurant and bar, located in One New Change, St Paul’s, London. Part of the Gordon Ramsay Group, the restaurant space resembles an industrial New York Style Loft and provides both a welcoming atmosphere, alongside a high-quality dining experience. Bread Street Kitchen’s globally inspired menu offers unique all-day dining options and focuses on home grown seasonal produce. Featuring two bars, it is also considered to be one of London’s most lively hangout spots, offering fun and innovative cocktails every day of the week. Adding to its global offering, Bread Street Kitchen can now be found in Dubai, Hong Kong and Singapore. Gordon Ramsay Group comprises a collection of restaurants and bars by acclaimed chef, restaurateur, TV personality and author Gordon Ramsay. Headed by CEO Stuart Gillies, it employs more than 700 people in London where it has a collection of 14 restaurants. The Group has a total of 31 restaurants globally and 7 Michelin stars, with international restaurants from Europe to the US, the Middle East and Asia. Originally rooted in fine dining, the Group has expanded to include more diverse and informal sites offering a wide variety of guest experiences around the globe, such as London House, Gordon Ramsay Plane Food at Heathrow’s Terminal 5 and Union Street Café in London, Gordon Ramsay Steak in Las Vegas, Gordon Ramsay Pub & Grill in Atlantic City, Le Pressoir d’Argent in Bordeaux, Gordon Ramsay Au Trianon in Versailles, Gordon Ramsay at Forte Village, Sardinia and Bread Street Kitchen in Hong Kong, Dubai and Singapore. Restaurant Gordon Ramsay in Chelsea is the Group's flagship venue, has held three Michelin-stars for more than 15 years. For further press information please contact Sarah Harvey (sarah@bacall.net) or Nat Frogley (nat@bacall.net) at Bacall Associates or Tel: +44 (0) 207 360 2880. This press release was distributed by ResponseSource Press Release Wire on behalf of Bacall PR Limited in the following categories: Leisure & Hobbies, Food & Drink, Travel, for more information visit https://pressreleasewire.responsesource.com/about.